We, the undersigned human rights and civil society organizations, write to call your attention to an issue of urgent and serious concern in Iran. We wish to urge you to use your respective mandates to make an urgent appeal to the government of the Islamic Republic of Iran with regard to environmental crisis in western and southwestern Iran. The environmental crisis in Ahwaz and other cities in Western and Southwestern Iran is indeed becoming a humanitarian disaster. Dust storms which have existed for years in this part of Iran, have been significantly intensified in the last few days and made local people to breath dust instead of air. For a good portion of year the amount of dust particles in the air reaches dangerous levels, sometimes up to 60 times the permissible level, and the air pollution up to 15 times the permissible level. On some days, the intensity of dust particles has been so high that it has rendered air pollution testing devices dysfunctional. Human rights and environmental protection are interlinked and the rights to life, health, and development undoubtedly depend on a clean, healthy and sustainable environment. The government of the IRI owes positive obligations towards its citizens in this regard and we are extremely disturbed by the fact that, the IRI has failed to effectively protect its citizens against environmental harm and to mitigate the consequences. On occasions, the dust has reduced visibility to less than 50 meters, which has resulted in some fatal car accidents with high numbers of casualties. According to official reports, everyday, an average of more than 250 people attend emergency departments in Ahwaz hospitals for respiratory problems while some of them need to be admitted to special care units. So far, official authorities have declined to give any statistics on air pollution related deaths. They also refuse to give any clear, non-contradictory, and accurate explanation and information on the reasons behind the crisis, responsible bodies, and solutions to the problem. It has been announced that the government has an “Executive Package” on the way to battle the dust storms, which sounds promising. However, the only tangible measure taken by the government so far in order to protect the lives of more than one million people of Ahwaz has been ordering schools and government departments closed. In the last two weeks alone, schools in Ahwaz have been closed down for seven days. Further, it was only days after the beginning of the crisis, and following public protests, that the government began distributing free surgical masks. 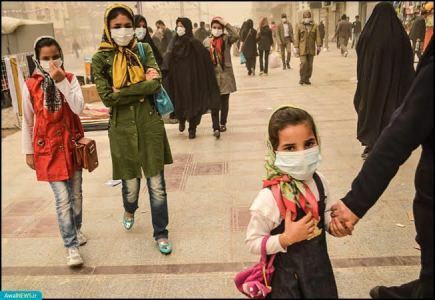 This was however limited only to Ahwaz and in other towns and cities people still have to pay for the masks. 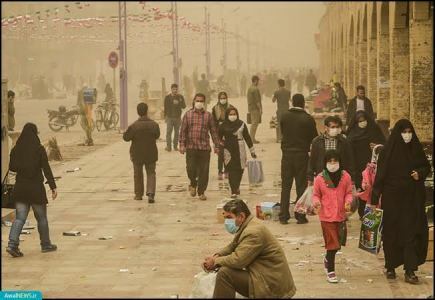 The intensity of dust and air pollution is also observed in other cities in Western and Southwestern Iran such as Ilam, Piranshahr, Abadan, Dehloran, Dezful, Hendijan, Mahshahr, Ramshir, Khoramshahr, Bukan, Mianduab, Hoveyzeh, Hamidiyeh, and Dasht-e Azadegan and Urmia (Orumieh) where the majority of population belongs to ethnic minorities who are subjected to discrimination and violation. The governments in the region, including the IRI, have failed to effectively and timely address the environmental problems and control harmful activities within their own terri­tories, which have caused the current disaster. Multiple reasons have been suggested for this environmental crisis, which has become more problematic since ten years ago and affected the lives and health of millions of Iranians. It has been claimed that drought as a regional problem, excessive use of water resources and the diverting of the Karun river, development plans without taking environmental concerns into account such as excessive construction of water dams in the region including in Iran, oil exploration projects, etc. have resulted in desertification and drying up of marshlands and lagoons, which used to prevent dust from getting into residential areas. Lack of cooperation between Iran and Iraq in preserving the marshlands is another factor contributing to the dust storms originated inside Iraq. Over the past ten years, the government of the IRI has not carried out any effective plan to prevent dust particles getting into the air breathed by people. Now this has turned into an emergency crisis with no short-term solution, if any, in the horizon. In a 2003 report, the UNEP had sounded alarm about the disappearance of two of the largest marshlands in the world and the largest ecosystem in southwestern Asia, Hur-ul-azim and Hur-ul-hoveyzeh, located on the Iran-Iraq border. According to this research, by that time 90 percent of this ancient and unique ecosystem had been destroyed. The report described the death of these marshlands as one of humanity’s worst engineered disasters and suggested that the only solution to prevent a major environmental crisis would be urgent measures to preserve these two international marshlands. However, this never materialized, neither by Iran nor Iraq, and dust particles raised from the dried-up marshlands became one of the main reasons of the current disaster that is unfolding in southwestern Iran, particularly the city of Ahwaz. It is evident that short-sighted regional and national development plans and poor environmental policy-making have contributed to this disaster. The governments in the region, including the IRI, have failed to effectively and timely address the environmental problems and control harmful activities within their own terri­tories, which have caused the current disaster. Take effective and tangible measures to prevent and mitigate harm to people. Take urgent and special measures to protect those most vulnerable including children, ill people, and older people. Carry out a comprehensive inquiry and hold accountable those responsible for causing the problem or failed to take effective and timely measures. Provide full access to information about the problem and its impacts on the health and lives of people, as well as the decisions made and plans adopted. Take into account in decision-­making process the environmental impact of activities on the right to life and health of people. Invite local authorities, independent experts, civil society and rights groups to participate in environmental decision-making. Provide effective remedies and access to justice –while ensuring non­-discriminatory treatment– for those individuals or communities who are directly affected by this problem. In conclusion, we request that you watch the situation closely until all required measures by the Islamic Republic of Iran are taken and the problem is solved. UNEP, The Mesopotamian Marshlands: Demise of an Ecosystem, available at: <http://www.grid.unep.ch/activities/sustainable/tigris/report.ph>.